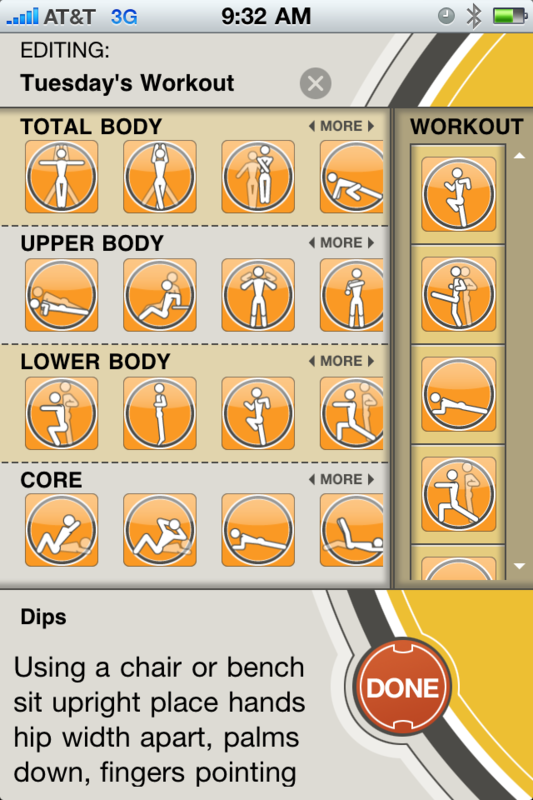 The Bootcamp app is an ideal way to strengthen your entire body and help prevent injury. This app is for anyone interested in toning, building cardio endurance, and losing weight. Circuit training consists of a series of timed exercises that focus on the total body including arms, legs and core muscle groups. If you are a runner and want to improve your time and distance, this is the perfect app for you! The Circuit Training app comes with 5 preprogrammed workouts. You can even create your own circuit training series by simply dragging and dropping the exercises you choose and saving it as your personalized workout. In addition you will also be able to control the duration of each exercise and rest period. Want to amp up your workout? Just add weights to your routine for an additional challenge. Download the app now to your iPhone or iPod Touch! For questions regarding this app please fill out this form below. Thank you! Started the Ease into 5K app on Monday. I was in the Marine Corps so running is not unfamiliar to me, but after 7 years of not doing any continuous running I finally made the desicion that it was time for me to get back in shape and I know running is a good start. Messed up a little this week and ran all three of the workouts from Monday-Wednesday… What can I say, I remembered the one thing about running that I liked! It is a good time to just clear your head of all the regular stress in your life… Thinking the Bootcamp app will be the way to go to fill in the gap until next week. We shall see! I am so happy that you decided to pick up running again. It’s amazing how much muscle memory our body has after not running for 7 years. Thanks for choosing our apps to help to get you to your fitness goals. Good luck! for the pre-programmed workouts, how much calories do you burn each program? Just wanted to let you know that C25K was my first step towards a real fitness change in my life and I recently hit 100lbs lost. When I read about the Bootcamp app, I was very excited, but I unfortunately need it for Android. This app would be perfect for me. Hopefully it will become available in the near future. Thank you! Thanks for your comment. Congrats on losing the 100 pounds. We are working on adding some new features to the Bootcamp app and then developing it for the Android market as well. When will this be available for Android? Thanks for writing. I don’t have a release date yet, but we are looking into bringing to the Android market as well. I am so excited to here you are going to be releasing Bootcamp to Android. My sister turned me onto C25K a few weeks back. Your product is the best out there! Especially for someone just getting starting, literally from the couch. Thank You! Thanks for this comment. I am so happy for you both. Keep up the good work. Add a feature in the BootCamp app to enable users to customize the break lengths between each exercise (especially for the custom routines). Add more weight exercises if you can like, and if you have time, add the ability to mix and match pure cardio (with the c25k and b210k apps) with the pure strength training routines of the BootCamp app. Oh that would be epic. Ill be HOOKED to your apps I tell you. Thank you for your awesome feedback and suggestions. We are working on a new update for the app and this is very helpful. I use an iPod touch and am unable to post my workouts to twitter – it says that I need to be connected to the internet to do that… but I am, via wireless network. Thoughts? button appears and pressing it to close the app. I have used you C25k app and loved it! Then I went to the B210K not liking too much…I made it thru week 3 and losing interest. Maybe now the workouts are over a hour long and not doing so well the intervals. One day I can do the whole work out then I skip a day and not do so well. What to do now? I think my pace is too slow. I dont know. I have made it this far trying to stay motivated. We all struggle with the exact same thing. How do I continue to push on when the mileage gets longer? How do I stay motivated? The answer is, there is no answer. Running is a physical and emotional strength that requires one to really dig deep to overcome, which you have mastered since you are still running and running longer distances. We all hit the wall and want to quit time and again. You could read our post about what to do when you hit the wall. I would also recommend doing some cross training workouts if you aren’t already. It will help you break up the monotony of running with something fun. This may help improve your runs by strengthening other muscle groups and pulling the focus off of your legs will help when you go out for your next run. Give it a try. Don’t get discouraged you are doing great! I use the Nike+ on my iPod 6th to run and was hoping there was a way to use this with it. My iPod already promts me during my music but wondered if this can be incorporated? We are too! Hope to have it available before the New Year! i am going to start the C25K today. Do you know if there will be a app for Blackberry coming out? I am interested in the circuit training when it comes out. Congrats on starting the C25K app today. We are looking into making the app available for other mobile devices. The Circuit Training app will be a great addition for runners in training. Can’t wait for it to come out as well. Check back with us on the blog for more details on both. Good luck on today’s run and let us know how it goes. If you loved the run please post a review http://bit.ly/a6WDhA. Are these apps only for iphone? Thanks for posting your question. The apps are currently available for the iPhone and iPod Touch. I second the request for 1/2 & full marathon apps. Your C25K app saved my life & marriage, (as we discussed in that interview), and I’ve started Bridge to 10K now. I have made a commitment to run in the Marine Corps Marathon in Washington, DC in November 2011 and would love to use one of your awesome apps to train for it. Any word on when this will available? I don’t have a date yet. Once I get closer to finishing it I will be able to announce a date when it will be available. I was also wondering if you had any plans to create a 1/2 and full marathon running app? I would love to see those and would buy them as soon as they were offered. I’m having a problem with your Couch to 5K iPhone app. I’ve had the problem before, but stopped running for a while and I’m trying to get back into it again. I have the latest version and iOS 4. The issue I have is that it just stops during the program and I can’t figure out what’s going on. I know I didn’t lock the phone and the lock icon was on. But when I get suspicious and check, the phone is locked and the app is not giving me cues, etc. I’m guessing multitasking support would resolve this issue. Any chance you will have an update for that soon? Otherwise, any other suggestions? I didn’t finish the program before, but I got to week 5 or so and I was able to do it. Hoping to keep it up and finish this time. I am so happy you are trying to get back into running. We are working on getting the iOS 4 update ready. In the meantime the alerts stop playing when the Sleep button on the iPhone is pressed. To continue listening to your music and alerts do not press the Sleep button for now. Sorry for any inconvenience this has caused you, but once the iOS 4 update is here you’ll love the new features we’ve added.